I was beginning to think Nathan would never lose his baby teeth. William lost a couple of teeth in kindergarten, so did Catheryn. 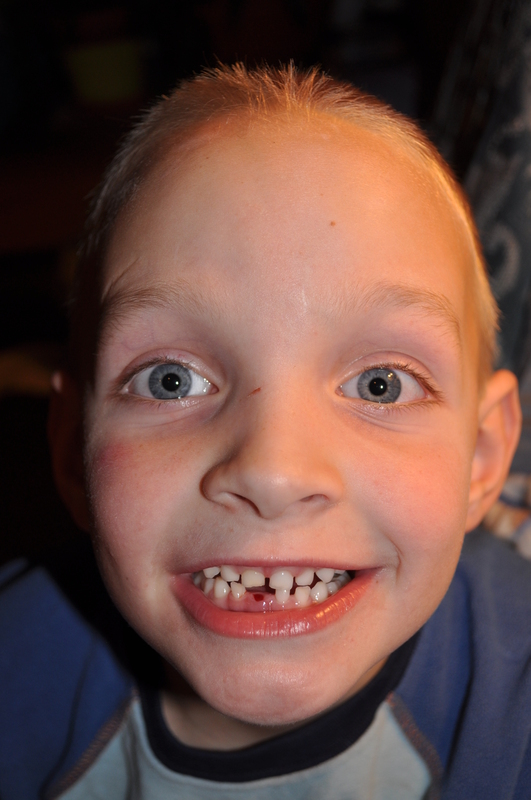 But here Nathan is, a few short weeks away from his 7th birthday, and all of his baby teeth are still intact. At least that was the case, until today. He came home with a wiggly tooth, and was determined to get it out. Of course in our house if you want a tooth pulled out, you go ask Dad. So armed with a piece of toilet paper, Nathan did just that. With a swift tug, Rob had the tooth out, and Nathan didn’t even know it. When he finally realized what had happened, he yelled, “I pulled my tooth out! !” The other kids were jumping up and down, congratulating Nathan on pulling out his first tooth, while Rob sat there looking on, everyone having forgotten that he was the one who actually removed the tooth. Nathan spent the rest of the night with a hand-held mirror, admiring his handy work, thinking he was the coolest thing since shirt pockets. Now Nathan is sound asleep, his very first lost tooth safely under his pillow, dreams of the Tooth Fairy dancing in is head. He is going to have some story-telling to do tomorrow. This entry was posted in Crazy Kids, Daily Life and tagged lost tooth, teeth, tooth fairy. Bookmark the permalink. Congratulations Nathan!!!!!!!!! We love you!!!! I’ll pass on your message! !